September 13, 2018, 11:19 a.m.
With the spectre of a leadership challenge from Boris Johnson hanging over Theresa May, last week YouGov compared public attitudes towards the Prime Minister and her Conservative nemesis. With renewed talk of a plot against the PM, but with Boris a divisive figure, it is entirely possible that any leadership contest would see another candidate emerge from the field to take the crown. In that scenario, the view from Westminster is that one of the most likely such candidates would be Sajid Javid, the current Home Secretary. In July YouGov research showed why Javid was currently best placed to be the next Conservative leader. Although he occupies one of the four great offices of state, and has held cabinet rank since 2014, Javid is a relative unknown among the public. For instance, when asked what they think of Javid in terms of likeability and whether or not he would make a good Prime Minister, the majority of Britons (54%) answered “don’t know”. Nevertheless, when asked who they would prefer to be Prime Minister between Johnson and Javid, the latter wins by 36% to 30%. 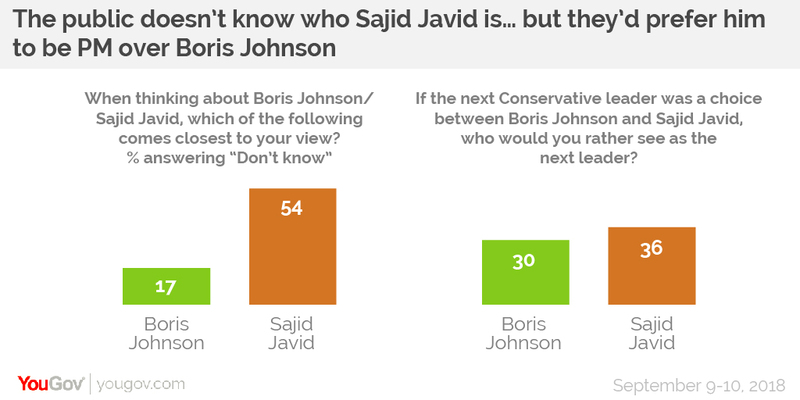 The 34% who responded “don’t know” is fully twenty percentage points lower than the figure who don’t seem to know who Javid is, implying that many support Javid simply for being not Boris. Support for Javid in this regard, however, comes from outside the Conservative electorate. Among 2017 Conservative voters the balance is 48%/32% in favour of Boris, and likewise 52%/21% among Leave voters. By contrast, Javid is much more popular among other voting groups, winning by 45% to 18% among Labour voters, 63% to 16% among Liberal Democrats and 57% to 10% among Remain voters. What do those who have a view on Sajid Javid think of him? Among those who do have a view of Javid, opinion is mixed. Overall 16% of Britons say they like him – this is the equivalent of 36% of those who actually have an opinion on him. Similarly, while 14% of all Brits think he would make a good Prime Minister, this is about 31% of those who have an opinion. Comparatively Boris is more well-liked, at 39% of Brits with an opinion of him, but seen as less likely to be a good PM, with only 27% of those with a view on Boris thinking so. Theresa May, however, is seen as the best candidate for PM of the three, at 34% of those with a view. On the likeability scale, with 37% of people with a view saying they like her she beats Javid but loses to Boris. When asked about his personal characteristics, Javid’s perceived competence is his stand out quality. By a two-to-one ratio people think he is competent rather than incompetent (31% vs 15% among all Britons, 66% vs 32% among those with an opinion). Javid is also more likely to be seen as decisive over indecisive (25% vs 18% among the general population, 58% vs 42% among those with a view). He is, however, not so likely to be seen as up to the job of Prime Minister – 28% of Brits say he is not up to the task, compared to 18% who do (among people with an opinion these figures are 61% and 39% respectively). In all three of these measures, however, he fares better than potential leadership contender Boris. See the full Sajid Javid results here. Some of the results for Theresa May and Boris Johnson are from a previous article and can be found here.